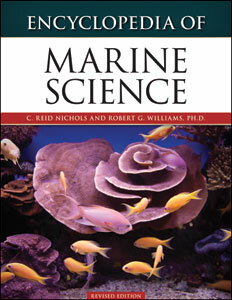 Authored by: C.Reid Nichols and Robert G. Williams, Ph.D.
An invaluable reference, Encyclopedia of Marine Science, Revised Edition explores the principal areas and issues of this core science discipline in hundreds of entries, essays, photographs, and line illustrations. This comprehensive encyclopedia brings together information on marine science from its component and affiliate sciences, along with information on technology, commerce, business, society, history, and more. Detailed entries cover concepts, technologies, phenomena, organisms, treaties and legal issues, research stations, places and geographical features, vessels, experiments, marine sanctuaries, scientists and lawmakers, programs, organizations, occupations and careers, and other subjects related to marine science. Spanning 1872 to the present and designed for high school and college students, Encyclopedia of Marine Science, Revised Edition concentrates on developments since World War II, including organizations, people, concepts, and laws of international or regional importance. C. Reid Nichols is the president of Marine Information Resources Corporation, a Maryland veteran-owned small business. He is a physical oceanographer with an M.S. from North Carolina State University and an M.B.A. from Loyola University Maryland in international business. He has served as a physical oceanographer for the National Oceanic and Atmospheric Administration and provided applied oceanographic solutions to a variety of commercial and government customers. Nichols joined the U.S. Marine Corps Reserves in 1977 as a combat engineer and, after commissioning, served in positions as platoon, company, and battalion commander and then as a senior staff officer until his retirement in 2011 as a colonel. Robert G. Williams, Ph.D., is an oceanographer with extensive experience in the fields of marine meteorology and physical oceanography. He served as a civilian scientist for the U.S. Navy and was a career oceanographer at the National Oceanic and Atmospheric Administration. He is currently a senior scientist with Marine Information Resources Corporation and an instructor in physics, astronomy, and meteorology at Craven Community College in New Bern, NC.